There are two main categories of emails: the emails you expect (legit emails) and the ones you don't expect (spam). And the email providers (Google, Yahoo, Microsoft, ...) all try their best to help us identify these two categories of emails. They try to guess the legit ones and put them in our main inbox folder while putting the spam ones in a junk or spam folder. Today's post is about a special type of spam email, the most dangerous kind of emails you will occasionally receive. They are technically known as phishing emails. But in plain English they are scam emails. They try to get your bank account details without your knowing. They try to get your very valuable personal details in ways that seem legit. They try to force you to do things you normally wouldn't do by using a mixture of threats and enticing promises. I am going to help you easily identify such emails. In fact, I will show you two of such I received lately and walk you through the visual cues that should signal danger ahead. Noticed the email I highlighted in the screenshot above? It's from the US Ambassador to Nigeria. Whenever you receive an email whose sender name is that of someone in a high political position then you should get a red flag. Open the email with caution. Don't be quick to click on any links within it or reply the email. Let's take a look at the content of the email the US Ambassador sent me. See all the parts of the email I highlighted? They are all the signs of a phishing (scam) email. There is a reply-to email that is linking to a yahoo.com.ph email account. Another red flag. There is too much personal details in the mail. No important person will give this much information to a stranger in one email. My name wasn't mentioned anywhere in the email and I was not expecting any mail from the US Ambassador. So this is definitely a mass email. 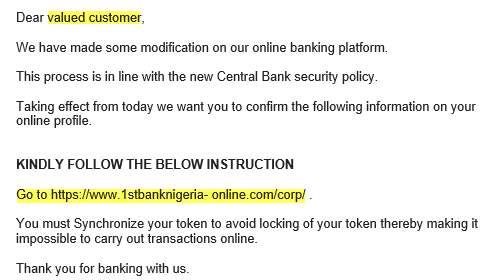 The email I highlighted in the screenshot above is supposedly from First Bank. The sender's email address is appropriate and raises no red flag. The suspicions begin with the title of the email. Why would a bank send me an email with three exclamations at the end of the email subject? No respectable organization will break the rules of formal communication that much. Let's look at the inside of the email. Again, some basic things are wrong with the email. Your bank has your personal details. Never treat an email from a bank that addresses you as "Dear valued customer" as worth taking any action on. Even when you call your bank's customer care, the first question you are asked is to confirm your full name. 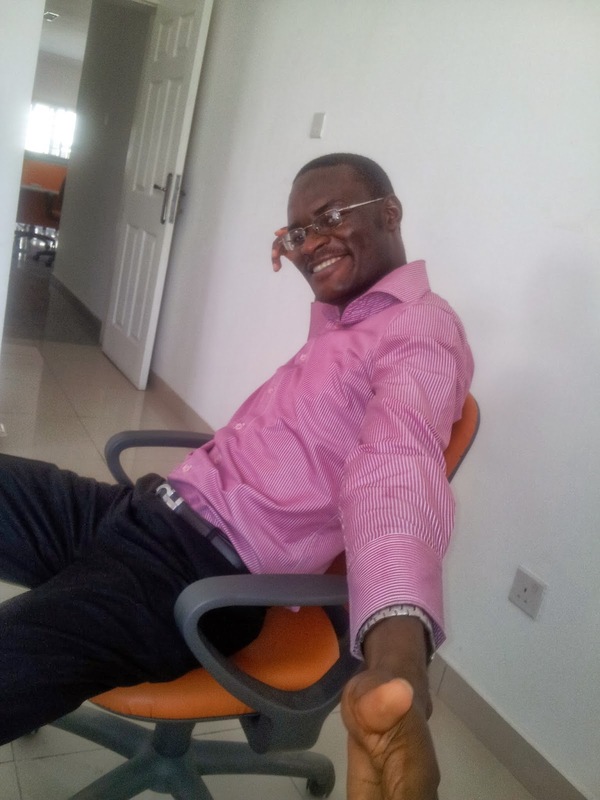 The link I am told to click on is not First Bank's website link. On a general note, never take any threat or call to action communicated to you by a bank via an email seriously. Always call your bank first to verify, Notice the threat of locking my token. 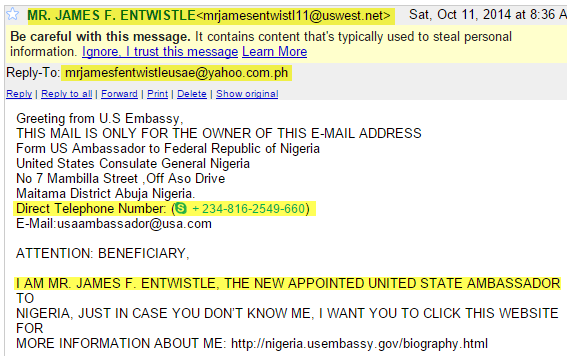 So those are the ways of knowing if an email is a scam. You might want to know why anyone would send you these types of email. They want you to reply. Like the one purportedly from the US Ambassador. Phishers have their own sales funnel. They blast emails to a large list of people and the people who reply get moved to the second stage of their phishing scheme. It doesn't matter if your reply is a threat to them to stop spamming you. If you want to prove that you are not going to fall for their scheme don't do so by replying just delete their emails. They want you to click on a link in the email body. Don't ever click the links in a scam email. Not even out of curiosity. A lot of things can happen once you click that link. You computer can get infected with a malware. The least terrible thing that can happen is that you are taken to a website that looks like your bank's website and asks for your login details. And that is still very terrible. Safe to make it a rule to never click a link in an email you were not expecting. They want you to provide valuable personal details. Either in form of a reply to the email or by filling a form that the link in their email body directs you to. And that is it for today's post. Hopefully, you now know all the signs of a scam email.